Question of the Day: What's Hanging in Your Cubicle? Our recent podcast “The Dilbert Index” looked at offbeat ways to measure employee morale. 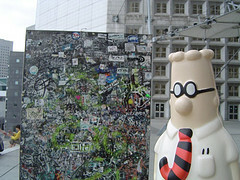 Damon Beaven, a blog reader we interviewed, noted that a lot of Dilbert comics in cubicles tends to correlate with lower morale. “A lot of Dilbert comics seems to be a passive-aggressive way of an employee complaining,” he observes. So what’s hanging in your cubicle? Let us know in the comments below — and, even better, send a low-res photo to photo@freakonomics.com so we can post your photos next week. The usual: Calendar, Sales Contest flyer from 3 months ago, a phone list for employees in other offices. And a 3-foot-tall, bald, clown pinata. I have a lot of boring reference information posted and pictures of my wife and boy, pretty standard fare for the office. I actually had a Dilbert comic posted, but it was regarding the use of a fax machine and an intentional jab to a guy in the office that hates emails (friendly jab). "People seldom rise above the faith placed in them. Don't limit your team's potential with your own low expectations of what is possible." I've got a wall calendar of my favorite soccer team and a patent application for a stick (a dog toy that looks just like a stick). Jimi Hendrix poster and a picture of a pint of beer . Very little. As a long-term contract worker, I know that I could be let go from a position at any time, so I don't like to make more trouble for myself if I have to take things down in a hurry. 1. My life verse (it's an Evangelical thing), 2 Tim 1.7, in New English Version and in Greek. 2. A plot of year-round Max, Mean, and Low Temperatures in the San Fernando Valley where I live. 3. A blown-up Pepper and Salt comic from WSG showing one suit talking to two others: "This is a serious issue that should be thoroughly reviewed and discussed until everybody is sick of hearing about it." 1. A sheet of paper with the words "Is This Good for the Company?" Office Space reference. 2. An email from our president about the latest round of layoffs. 3. A Simpson's cartoon image emulating the Beatles' Abbey Road album cover. I guess two out of the three things I use to "express" myself are somewhat negative, morale wise. - A calendar featuring Michigan landmarks. - A 4'x3' Welsh flag. - Some notes I compiled about this company's coding standards. - My grill-winning ticket from a company raffle. I don't think I've seen a single "demotivational" poster in this building, it's very refreshing. A Dilbert strip that refers to our Vice Chairman's offer to let his employees buy wine from his personal winery with a coupon for 20% off. A demotivator calendar. This month: "Procrastination: Hard work often pays off after time, but laziness always pays off now. " "Making a speech on economics is a bit like peeing down your leg. It seems hot to you but never to anyone else." I had an obama poster hanging in my office after he was elected. I worked in a place run by Republicans who were adamantly against Obama. It was my little jab back at the man. As an analytical type in a world of marketeers I have a little quote from George Bernard Shaw hidden on the desk. "The power of accurate observation is commonly callled cynicism by those who haven't got it"
I no longer work in a cubicle, but when i did my most interesting thing hanging from my walls was a whisk. I have a a parking sign that says "Employee of the Month". It was in a trash pile at my previous employer. Just one picture of Milton Friedman. Coaster and stickers from local and far-away craft brewers I've visited. Picture sent! « Previous PostHow do the Times and the Journal Report a Drop in Wall Street Bonuses?